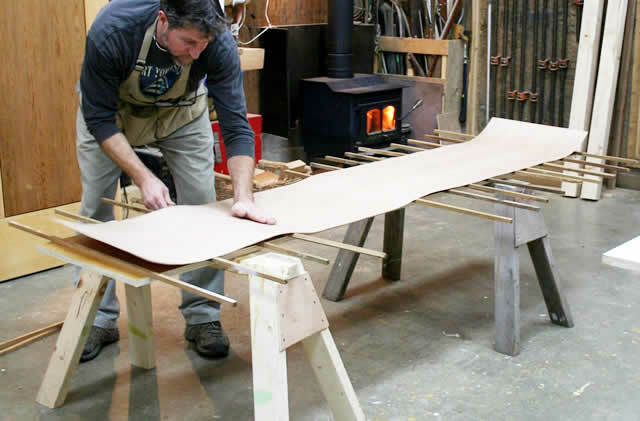 The bonding of different materials used in boatbuilding entered a new age when synthetic adhesives became waterproof and tremendously stronger than the materials they are bonding. The challenge today is the plethora of adhesives available. Each type has its pros ans cons which can makes it difficult to choose the right adhesive for your project. Unfortunately there is no ‘silver bullet’ – an all-in-one adhesive that can cover all your needs so it is a good idea to be familiar with the characteristics and capabilities of the range of adhesives. What is adhesive and how does it work? Most adhesives today are synthetic polymers that are a chain of the same repeating molecules which attract themselves to form an interlocking medium. Adhesion occurs when the interlocking polymers stick to two faces that are then placed together and bonding occurs when the polymers eventually harden. The faces to be joined must be porous or textured for adhesion to take place. There is the illusion of new adhesives coming into the market all the time. Similar to selling laundry soap, the marketing makes it seem like there is always a ‘latest and greatest’ adhesive product. The fact is that adhesives haven’t changed that much over the years, just the marketing. Following is a list of adhesives glues that are in common use around boatbuilding and repairs shops for a wide range of bonding tasks. 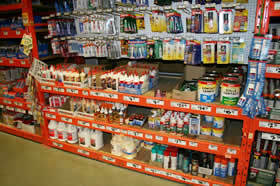 Adhesives that are hard to find, don’t store well or are hard to use have been purposely left out of the listing. PVA s a one part emulsion that utilizes water as its solvent to keep it liquefied. When the water is absorbed and evaporates it leaves the PVA to harden and cure. Water-resistant PVA (for example Titebond II) and water-proof PVA (for example Titebond III) both cure in this fashion and also have a chemical reaction to provide the water-resistant or water-proof qualities. To name a few common PVAs: Elmer’s, LePage, Weldwood, Gorilla (PVA) Glue and Weldbond. . Attributes: non-structural, interior and exterior, with porous materials and especially wood. Great for General household woodworking and boat work such as Titebond II used for all interior construction. Draw-backs: PVAs tack up quickly and therefore lose a considerable amount of strength over time. Large or complicated areas requiring lots of time for adhesive application are better done with an adhesive with a longer ‘open time’ such as an epoxy. Toxicity: Low toxicity but polyvinyl acetate is a carcinogen if inhaled. These are the slow cure epoxies, not the ‘5-minute’ epoxies. Epoxies are two-part adhesives that utilize a liquid resin and a liquid catalyst. They are available with varying cure times and are water-proof and solvent-resistant when cured. A few common brands are West System, Cold Cure, Industrial Formulators, System Three, G-1. Attributes: interior and exterior use; cure to a clear colour; great for bent laminations. Epoxies don’t shrink when curing so are good for gap filling. Their long open time is good for complicated glue-ups. They require little clamping pressure. Filler can be added to epoxies for gap filling, to match colours or to create a fairing compound which is easy to sand. Up to 40% fillers can be added to epoxy without compromising its strength. When using thickened epoxy, surfaces should be wetted out first using clear epoxy. This saturates the surface first so the thickened epoxy will retain its full bonding strength. Draw-backs: epoxies are expensive and don’t bond well to all woods (for example, oak and teak with natural oils and/or tight grain structure. Epoxies also will break down in high heat and exposure to UV rays. In bonding dissimilar materials (wood to metal, for example) bonds may be broken by expansion and contraction from moisture in the wood and/or temperature flux in the metal. Epoxies also don’t bond non-porous or smooth materials. In fact, because of its tight molecular structure, epoxy has trouble bonding to an already cured smooth epoxy surface. All smooth surfaces must be scored with an abrasive to provide a structure to which the epoxy will bond. Epoxies are not suitable bonding joints between large timbers that are subject to changes in moisture content or below the waterline. Whereas the wood moves with moisture the epoxy doesn’t and the wood around the bonded area can eventually sheer next to the joint. Toxicity: epoxy as been linked to allergic reaction and sensitization which can remain with individuals indefinitely. Gloves, eyewear and a carbon respirator are advised and avoid carriage of epoxy dust outside the job site on coveralls etc. These one-part adhesives cure when exposed to moisture. They expand, forming a foam during curing and can provide gap-filling capabilities abilities but don’t provide structural strength in the gaps. Brand names include Gorilla Glue, Elmer’s Ultimate glue, Titebond polyurethane glue. Attributes: suitable for non-structural, flat laminations. Waterproof when cured. Bonds dissimilar materials such as wood to metal. 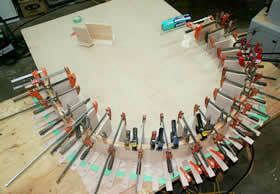 If gluing porous and non-porous surfaces, wet only one side first with the glue on the other side, then clamp together. Draw-backs: polyurethane glues are expensive, especially when compared to PVA alternatives. 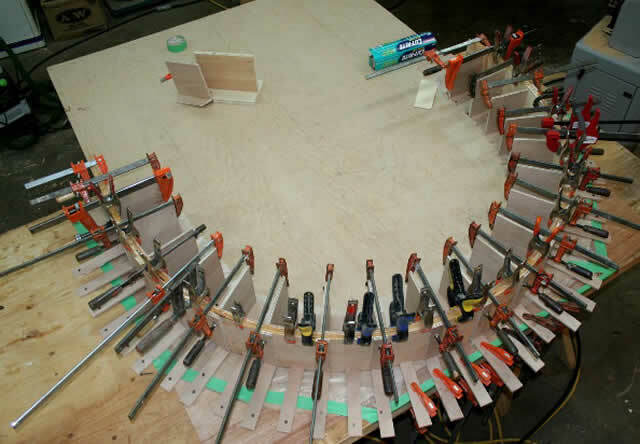 Joints may fail in curved laminations. Toxicity: One of its ingredients is a strong sensitizer and can cause allergic reactions. Do not use if you have any respiratory ailment. Attributes: non-structural interior use. Used for bonding wood veneers to surfaces; plastic laminate to counter-tops. Both surfaces coated, then they are connected after the recommended wait-time to form an immediate bond with no clamping required. Draw backs: limited uses. Water- resistant, not water-proof. Toxicity: Vapours from the solvent-based cements are highly-flammable and toxic. These are two-part (resin and catalyst) paste-like products used mostly in the auto body repair industry for filling and fairing dents and holes formed by rust. These fillers are a matrix of a polyester resin and cotton and/or fibreglass powder. Bondo and White Lightning are two common brands. Attributes: Polyester filler can be used as an adhesive and in some boatyards it is used to secure plywood panelling to the inside of fibreglass hulls. Draw backs: Not typically used as an adhesive. Toxicity: Vapours from the solvent are highly flammable, toxic; the catalyst can burn skin. The polyurethane adhesives are solid-coloured, rubber-like polymers. Polyurethane is used in making a wide range of products such as durable paints, adhesives, varnishes, hard and soft plastics. Polyurethane caulking is used throughout the marine, automobile and aircraft industries and brand names include Sikaflex, 3M 5200, PL Premium, to name a few. Also common in the market now are ‘construction-grade’ polyurethane caulkings. Manufacturers of marine caulkings claim their products have superior ultra-violet protection (the white colour shouldn’t yellow), better consistency for more even flow and generally are more flexible for the marine environment. Attributes: used for interior and exterior, non-structural bonds and flat laminations, bonding of dissimilar materials, bedding deck hardware that are resistant to water, most solvents and oil when cured. Most polyurethane beddings act as adhesives so are not generally suitable if a bedded item needs removal in the future. Polyurethanes are available in fast or slow cure times. Slow cure, if the tube is stored well, enables further use at later times. On the other hand, fast cure will set up to the flexible, tough, paintable consistency considerably faster. Polyurethanes can be cleaned up with methyl hydrate which is one of the safer solvents available. Draw-backs: once the tube is opened the cure starts. Construction-grade polyurethanes are usually packaged in cardboard tubes (versus metal) not designed to be stored for long periods of time. Toxicity: the solvents in uncured polyurethanes are reportedly carcinogenic. Frequently in the boatbuilding industry there is the need to bond dissimilar materials, for example wood strapping or insulation to the inside of aluminum or steel hulls. Because metals are prone to expansion and contraction with fluctuating temperatures, the adhesive must be flexible. Also metal surfaces are prone to condensation so adhesives need to be water-proof. When bonding foam insulation panels the adhesive must be free of any solvents that may break down the foam. The polyurethane bedding adhesives generally adhere to any material, are flexible and water-proof and don’t contain solvents.